Soroptimist International is a global movement of women, with members belonging to more than 3,000 clubs in 126 countries/territories, spread over 4 federations. Members of Clubs represent a wide range of occupations, talents and interests. The theme "Soroptimists - Educate to Lead" with a focus on Education, Enable and Empower provides opportunities for members to improve the lives of women and girls world wide. Through international partnerships and a global network of members, Soroptimists inspire action and create opportunities to transform the lives of women and girls by: advocating for equity and equality; creating safe and healthy environments; increasing access to education; and developing leadership and practical skills for a sustainable future. Soroptimist International is a Global Voice for Women working through AWARENESS ADVOCACY and ACTION to EDUCATE, ENABLE and EMPOWER women to promote human rights for all, equality, development and peace. The organisation works together with other non-government organisations (NGOs) and various United Nations agencies to bring about changes to make the world a better place for this and future generations. The international organisation is comprised of four Federations, each of which has its own administrative and leadership structure. Each Federation has representation on the International Board and takes turns at filling leadership positions and proposing international projects. The international organisation maintains a database of information about the work done by Clubs and Regions globally, allowing it to be an effective Global Voice for Women. World War I was a major catalyst for women. They left behind their aprons to do jobs which were usually done by their male counterparts. Women became used to being a member of a valued workforce, having independence and earing their own money. One such woman was Edith Glanville. Edith Glanville's 18 year old son was one of the boys who died on the battlefield. She formed an association which would stop all wars, so she was ahead of her time. A forceful lady who didn't seem to let convention become a problem. She formed a Quota club in Sydney with a team of like minded women and commenced a round the world journey pursuing her ambition to outlaw all wars. Whilst in the United States she attended a meeting held by the American Soroptimists and was so impressed she returned to Sydney, sent back the Quota charter and formed her band of followers into Soroptimist International Association of Sydney. The Americans formed the first Soroptimist Club, whilst Britain formed a similar one. In 1921 they amalgamated into Soroptimist International Association. Back in Australia, the Federation of Great Britain and Ireland (SIGBI) claimed the fledgling club of Sydney, and the charter of the Sydney club finally took place in 1937. World War II added confusion to the operation of the club, as contact with the British Federation was severely hampered. Edith proudly wore the chain of office for these 8 years. 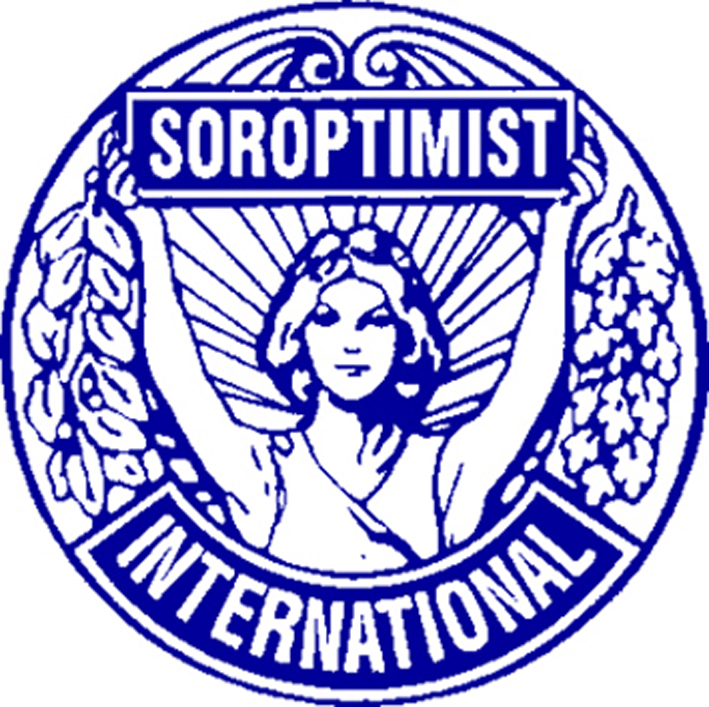 Soroptimist International was a category club, which meant that clubs could only have one member of a category, but after 5 years another member of the same category could be admitted to the club. 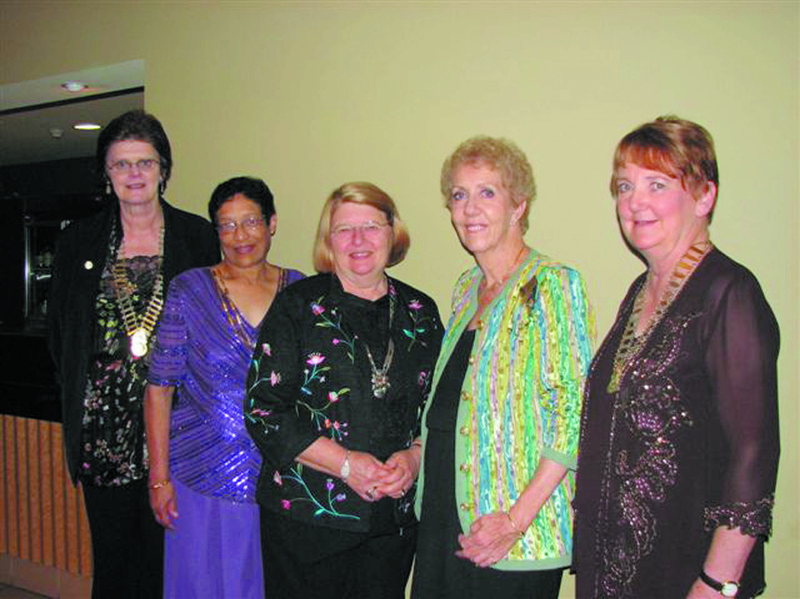 The growth of Soroptimist International was quite phenominal, despite the stringent rules of entry and membership. Tremendous projects were successfully carried out by clubs. 1939 saw Soroptimism arrive on the shores of New Zealand with SI Wellington becoming the first Soroptimist club, but it took until 1949 for SI Christchurch to be charted, followed closely by SI Auckland. Conversation amongst members was now focused on forming a 4th Federation of Soroptimist International. It was not until Betty Loughhead was appointed chairperson of the Co-ordinating Committee of Australia and New Zealand in 1967 that a Pacific Federation was seriously considered. 1971 saw a club formed in the pacific nation of Fiji, with the charter of SI Suva, Fiji becoming the third Nation to join the Council (CSWP). More Fijian clubs joined the CSWP and clubs continued to be charted in Australia, with clubs in Victoria, Tasmania, Queensland, South Australia and Western Australia. In 1973 the Federation of Great Britain and Ireland held their conference in Sydney, allowing many Soroptimists from Australia, New Zealand and Fiji to attend. Finally in 1978 the 4th Federation - Soroptimist International of the South West Pacific was formed, what a joyous occasion this was. The inauguration ceremony of the Federation of the South West Pacific was held in Adelaide at Easter in 1978, such a great moment when SI President Hilda Richardson handed over the Charter of the Federation of the South West Pacific to Her Excellency, Maris King and invested her with the Insignia of SISWP. We had made it!. 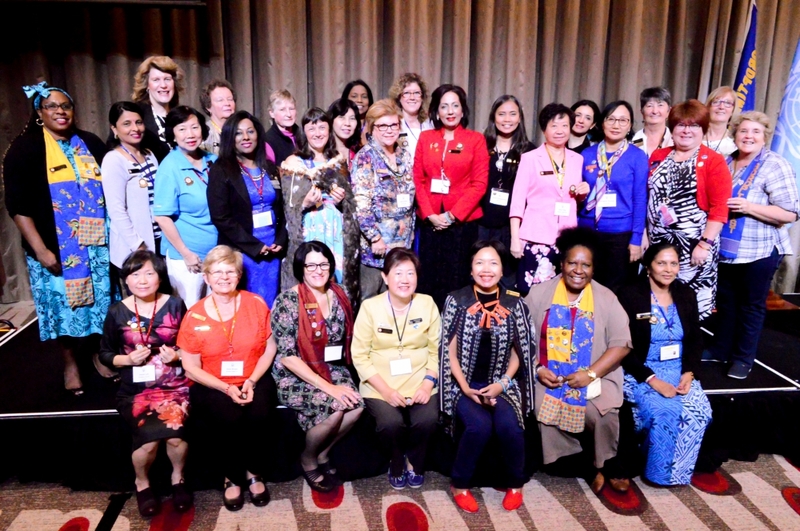 Diversification of Culture occurred in the 1990's, with the introduction of Malaysia, Indonesia, Solomon Islands and Mongolia to Soroptimist International of the South West Pacific. These new countries and members created opportunities to support projects whilst building friendships of understanding across cultures. Diverse cultures add a richness to the organisation. History of the insiginias over the years. Zanaa Jurmann the first President of SI Mongolia recalls "I first met Dr Indrani Manuel, SI Malaysia in September 1999 when I was attendig a UN Regional Meeting. We met in the bus that was transporting women delegates between the hotel and the Conference Venue, then on the last day of the Conference we were sitting next to each other and I asked her about herself and remarked on the small pretty badge on her chest, so then started to tell me in some details about Soroptimist International and SISWP which interested me greatly". Jennifer Gaylard joined the Cobram/Barooga club in 2003 ater attending a meeting as a guest. During that meeting the club members decided to 'buy a goat', for a women living on the African continent, and I was sold!, I thought, "this is the club for me', such a practical and innovative way of helping one women to improve the quality of life for herself, her children and indeed her entire village!. Dr Indrani Manuel, Looking back over 24 years as a member of SISWP, my passion for the ideals for which Soroptimism stands has enabled me to undertake this journey by doing in in my own way and at my own pace, I am thankful, proud and honoured that I was given the privilege to serve SWP from 1998 until today, as Malaysia's first National Representative on the newly constrituted Federation Board 1998-2000, SISWP Programme Coordinator for Education 2000-2004, Federation Programme Director 2004-2007, representing SI at the DPI session at United Nations in 2005, SWP Representative on SI e-TIS Editorial Committee 2009-2011 and a member of the Editorial Committee of the Soroptimist SWP since 2011. Thank you to all Soroptimists near and far who have shown me the way. Lorna Mead, serving at International level as Extension Convenor, developed my perspective of how exciting and varied the countries in our global organisaiton are, and how much they have to offer to the Federation. Bronwyn van der Meche, I had been involved in education for more than most of my career, I have always had an interest in social issues and have actively participated in the Teachers Across Borders (TAB) programme providing workshops to teachers in Cambodia. After an invitation to an SI breakfast I became aware of the goals of SI and realized that the organisation fitted very nicely with my values and that I could contribute to achieving their goals while meeting and sharing experiences with a range of members at the more social level as well.